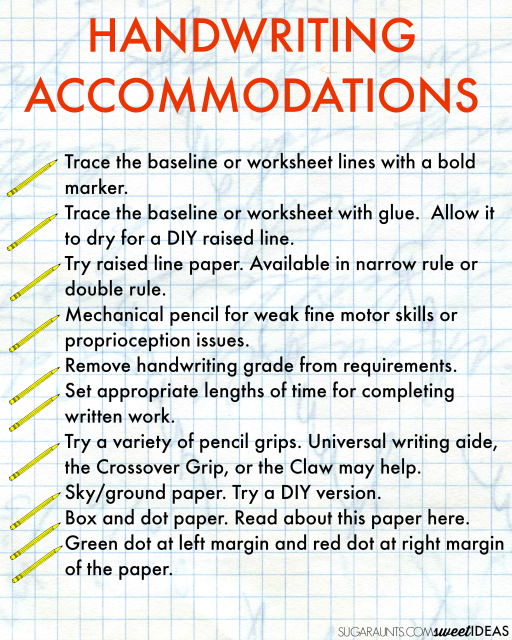 Handwriting accommodations for the classroom can help the child who has tried many handwriting strategies for improving legibility and written work. Try these classroom accommodations to help with spacing, line awareness, and letter formation in written work. These handwriting ideas can be used by educators, therapists, and parents across the curriculum in everyday writing tasks. Try using one or more of the strategies at a time and combining techniques to meet the individual needs of the child. 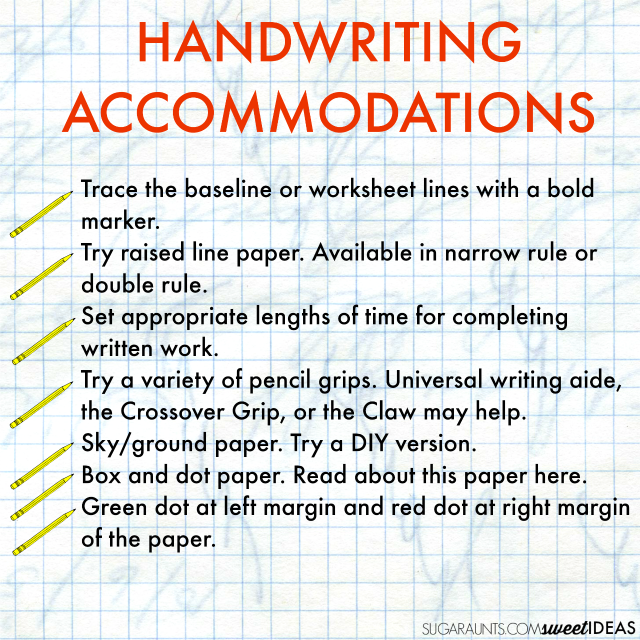 Here are MORE Handwriting Accommodations to try. Trace the baseline or worksheet lines with a bold marker. Trace the baseline or worksheet with glue. Allow it to dry for a DIY raised line. Try raised line paper. Available in narrow rule or double rule. Mechanical pencil for weak fine motor skills or proprioception issues. Remove handwriting grade from requirements. Don't require a handwriting grade. Set appropriate lengths of time for completing written work. Allow more time for completing written work. Allow dictation of written work. Writing strip on the desk. Erasable pen to provide less resistance on paper. Graph paper for written work, spelling tests, and math problems. Allow the student to type their spelling test answers. Bold lined paper. Available in single rule or double rule. Try a variety of pencil grips. Universal writing aide, the Crossover Grip, or the Claw may help. Sky/ground paper. Try a DIY version. Box and dot paper. Read about this paper here. Green dot at left margin and red dot at right margin of the paper. 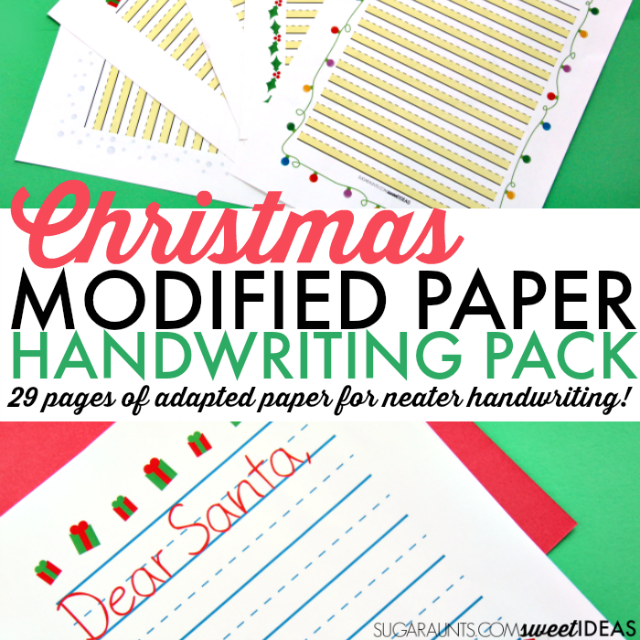 Flexibility with written work: use all capital letters or use printed work instead of requiring cursive. Highlight answers on tests instead of writing the answer out. Use a stamp or highlighter to mark multiple choice answers. Divide tests into smaller writing portions. Dictation/note taking app on tablet/iPad. Google Chrome's Read and Write extension is one idea. Laminate worksheets or slide them into a sheet protector. Student can use a dry erase marker for answers. Provide larder space for filling in worksheets. Try enlarging the page. Use letter tiles to spell spelling words. Handwriting checkpoints. Throughout the day, the students and teacher should encourage a self-check using a handwriting checklist. Tape guide on the desk to help with paper position and consistent tilt or slant of written work.